I made a pocket for this project, and inserted a small tag. 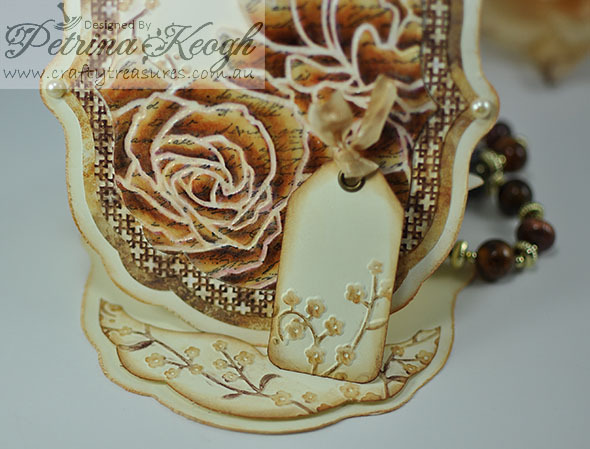 NOTE: The Prima stamp I used is quite firm on an acrylic block, the firmer the stamp the better! 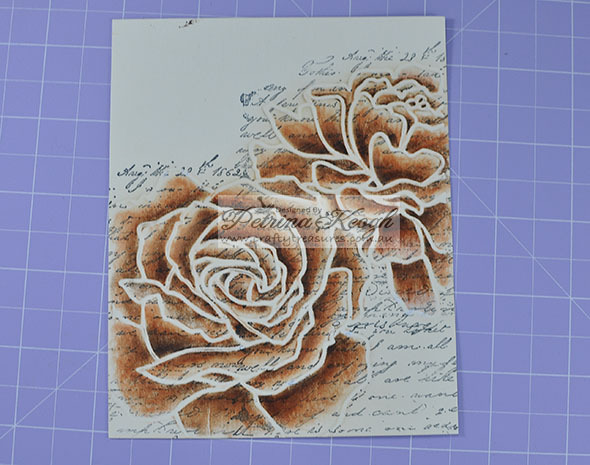 The polymer stamps can be a bit too soft for this technique. But if you very light handed stamper, you might be lucky. 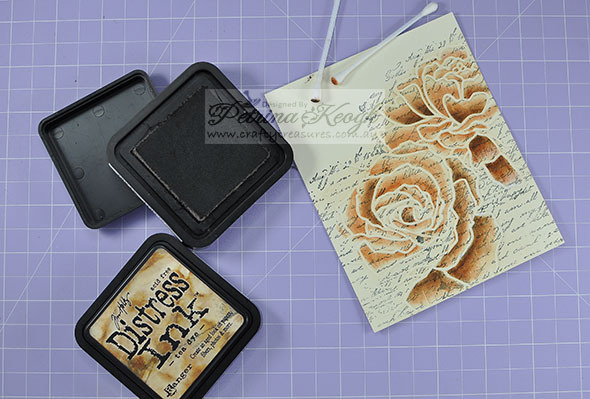 Or you can maybe use a freshly inked pad and feather light pressure, you may achieve better results with a polymer stamp this way. 3. 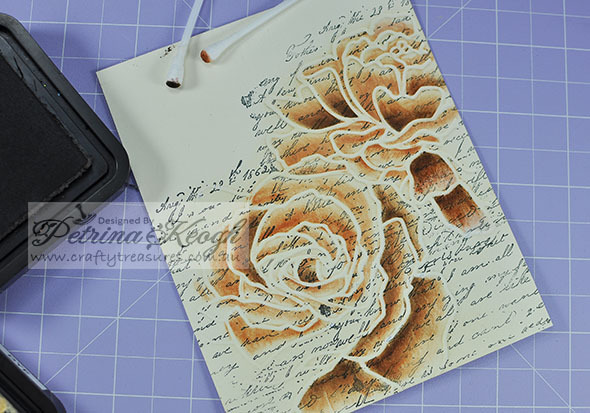 Ink your Prima stamp and stamp up the embossed surface. In this photo, it was meant to show you that the grouting basically has no stamped image within it….Yayyyy! 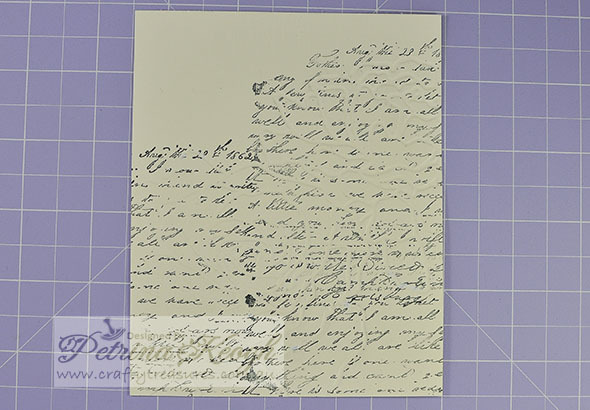 But it is hard to see what I was hoping to show you! If you do get some in the grout area, use a gel pen to white it out, or you can lightly bleach it away with half strength bleach. 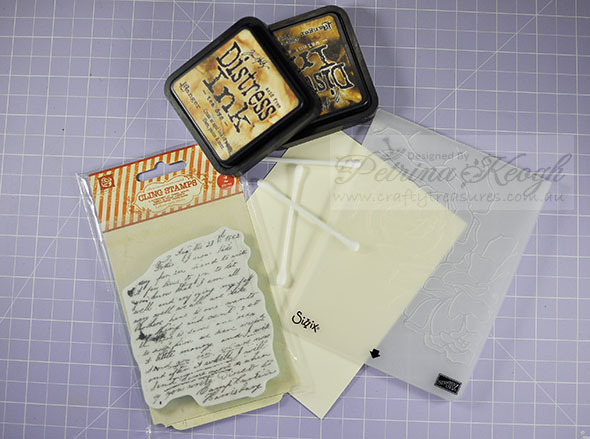 Would be fab, if one day they made a Cream/Ivory coloured gel pen. 4. 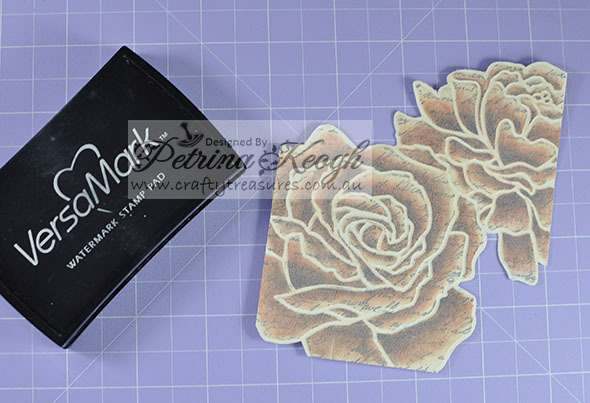 Start with the Tea Dye and a Q Tip at the base of each petal, colour in a circular motion and gradually work your wayup to two thirds of the petal, but lighten your pressure so it is softens towards the top, continue to do this until you have finished the tea dye colour. 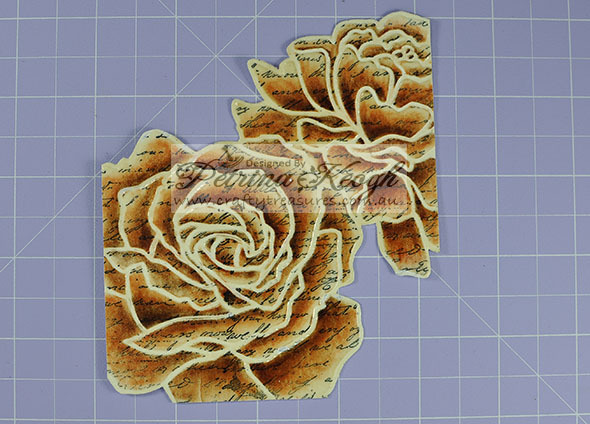 Colour with the Walnut Stain the same way, but only do this a third of the way up the petal. When you have the walnut stain finished, re touch the tea dye from the walnut stain upwards to blend to two together more. Blending does become a little easier when there is more colour on there. 6. This is the finished piece, grab your scissors and trim around the outer edge, just inside the last grout edge. 7. 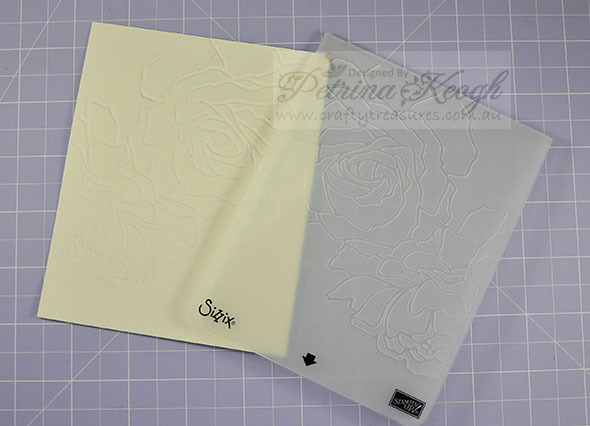 I gave mine a coat of Versamark and coat of clear embossing powder (twice). You can see how much it really brings that colour out and makes it pop! 8. Now you are ready to use this for your project. This is really cool! Splitcoast has a tutorial similar to yours, but yours is so much simpler while giving such a wonderfully dramatic impact. If I knew how to bookmark on my I-pad, I would make this my first bookmark. Alas, since I do not, I will add your photo to my Splitcoast favorites and keep it there. Great job! Thank you for sharing. Blessings. GREAT TUTORIAL!!!!!!!!! ( I found you through SCS) LOOOOOVE your finished project !!!!!!!!!! THANK YOU! 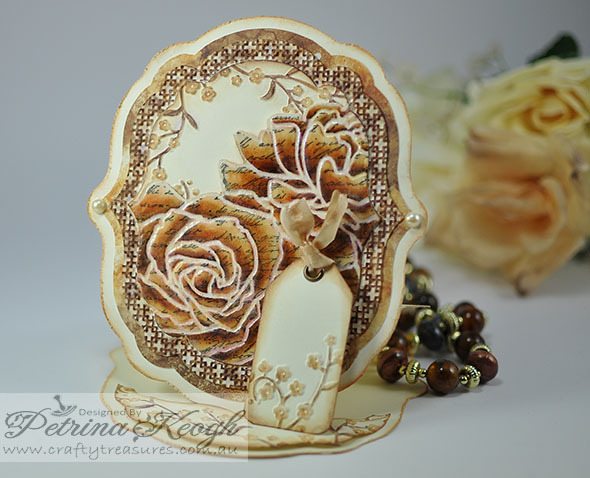 Petrina, what a stunning technique! 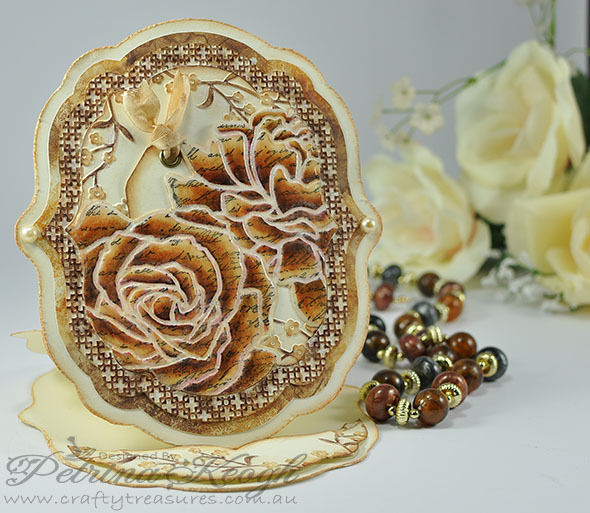 Thank you for showing how to create these gorgeous roses. 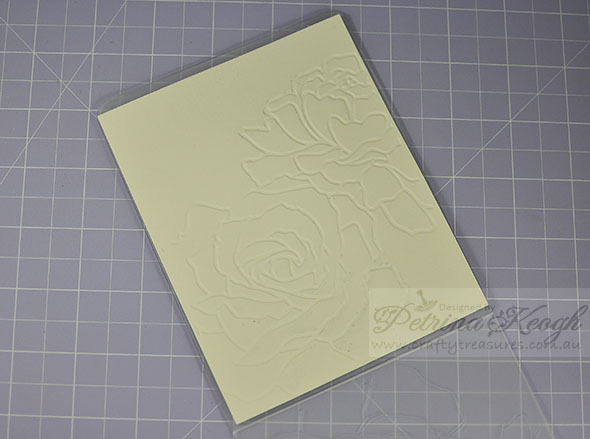 I would never have known and never used my embossing folder to its fullest. I can see it will take practice to perfect! Beautiful! TFS.